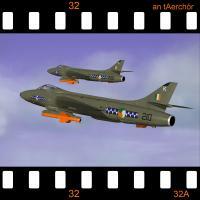 This is a very simple mod of the Third Wire DLC Hawker Hunter F.6(60) to give a fictional Hunter F.6M in service with the Irish Air Corps during the 1966 to 1988 timeline. You'll need DLC001 - the Hunter F.6 (60) of the Royal Netherlands Air Force for this to work but if you haven't got it you can hack this package to use whatever stock Hunters you have but expect to lose some functionality. If you'd prefer to use the standard RAF scheme then I've included a Patch template to help you easily produce the Patch.bmp for your skin folders. Also included are an Irish Air Corps Pilot and the 'Sleagh' infra-red homing air-to-air missile which is simply a licence-built Red Top but with the familiar IRM growl and an orange skin. Stock RedTops can be used and these Hunters are equipped with the Lightning gunsight which gives a quirky visual confirmation that your missile has lock-on. 1. From the AIRCRAFT folder drag and drop the Hunter6iac folder into your Aircraft folder. 2. From the DECALS folder drag and drop the Hunter6iac folder into your Decals folder. 3. From the PILOTS folder drag and drop the PILOT_IAC folder into your Pilots folder. 4. From the WEAPONS folder drag and drop the SLEAGH folder into your Weapons folder. As always, big thanks to Third Wire for the continuous improvement of a great little game/sim. Next File TSF Saab JAS 39 Sea Gripen-C Package.